I lup my friends. I lup having them around to keep me company, I lup having them around to make decisions for me, I lup having them around to help plan for me, I lup having them around to go to their house to chill out, I lup having them around to play with... the list goes on. I think I will be lost and bored without them. Last week, went to Baba Jo's places for lo hei. I sort of tried to organise it at the beginning but gave up halfway and Baba Jo took over ... heeheehee. I am a starter, not a finisher i guess. 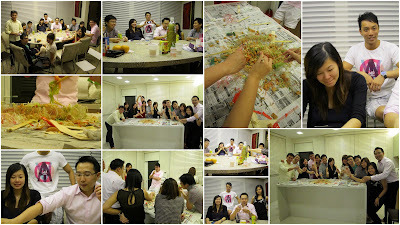 Thanks for waiting for us for lo hei ! Then, on Saturday, Mr V cooked "cully kuay" for us.. also known as curry chicken! Yumz.. although he used the A1 curry mix, he said the difference was due to the secret additional ingredients which his mummy lovingly added. The curry was so good. If i werent watching my weight, i would have cooked some maggi noodles and eat it "curry maggi noodles" style. Lynn came and worn LTW owl earrings! So pweeettttyyy!! !